Can the Current Normalcy in South Sudan Last? Video screenshot of former Machar security adviser William John Endley, left, and former Machar spokesman James Gadtet William. Kampala — The European Union (EU) has implored the parties to the conflict in South Sudan to hold to account persons accused of committing violence. "We expect all parties to hold perpetrators of violence to account and ensure that transitional justice and accountability mechanisms are in place for the people of South Sudan," the EU said in an October 31 press statement. Additionally, the EU called for the release of all prisoners of war, which, going by reports, President Salva Kiir's government has been doing since September. 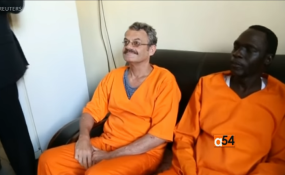 The latest prisoners it has released are James Gatdet, the former spokesperson of Dr Riek Machar, the vice president, and Mr William Endley, a South African national. On September 27, the Sudan Tribune reported that President Kiir had ordered to release all the prisoners of war, and detainees in line with the revitalised peace agreement. The newspaper said Mr Kiir stressed the need to register and hand over the released prisoners and detainees to the Red Cross. Relatedly, The New York Times reported on October 25 that South Sudan had released five prisoners of war though none of the five appeared to be among the senior members of Mr Machar's rebel faction. The EU said it is important that all parties immediately observe the provisions of the Cessation of Hostilities Agreement of December 2017 and disengage and separate their forces in close proximity as agreed by them. "Full and unimpeded humanitarian access throughout the country is equally paramount. Recent reports have documented grave human rights violations and abuses in South Sudan, some of which may amount to war crimes and crimes against humanity," the statement said. "We expect all parties to hold perpetrators of violence to account, and ensure that transitional justice and accountability mechanisms are in place for the people of South Sudan. "The full implementation of actions, such as releasing all prisoners of war and political detainees, would build confidence among South Sudanese parties and with the international community and is critical for an effective peace process, with political and economic inclusiveness, transparency and accountability."